Fish For World Class Kenai River King Salmon! 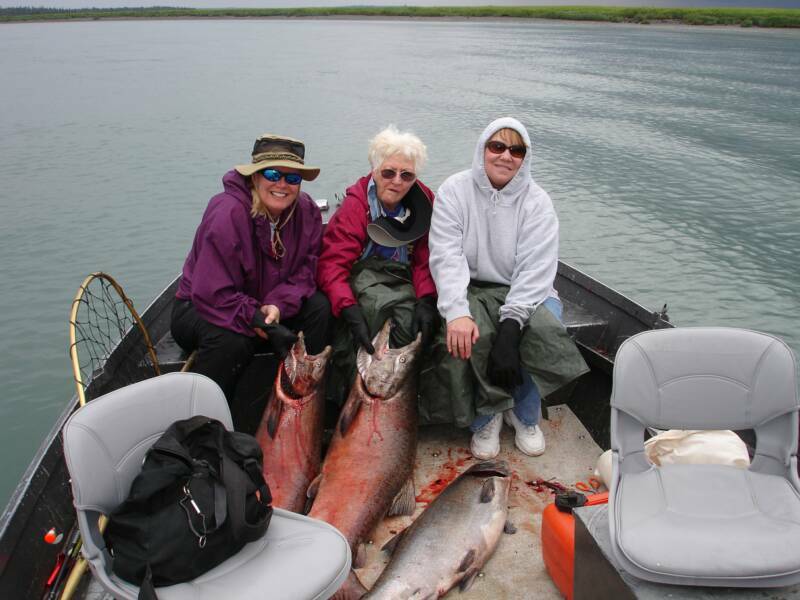 Not many other services know Kenai Peninsula Fishing in all of it's varied forms like we do. We have been here, successfully serving sports fishermen, since 1988. We know how, when, & where to locate the best Fishing for Salmon and Halibut on the Kenai Peninsula. 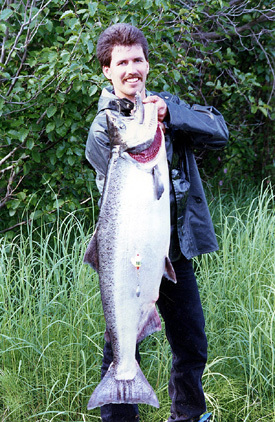 Imagine Fishing the world famous Kenai River one day for record setting Salmon, & the next day battling a giant Pacific Halibut, then enjoying incredible sights while Fishing out of Seward for Silver Salmon and Ling Cod and finishing your trip with a majestic fly out catching Salmon with BEARS as your partners. The possibilities are endless and the choices are yours. Experienced Guides, and the best equipment money can buy ensures a Fishing vacation of a lifetime! 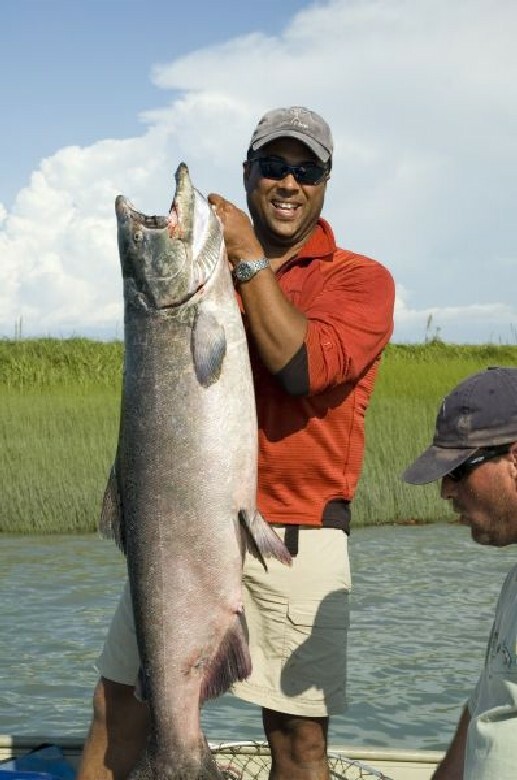 Each May Kings return to the Kenai Peninsula waters and they remain here until the end of July, so whether Fishing on the Saltwater, Kasilof or the Kenai River for these giants, get ready for some rod ripping action! With four different species of wild Salmon and two runs of each of the Salmon species makes The World Famous Kenai River prime time Fishing May through September. August and September are also great for Rainbow Trout and Dolly Varden. 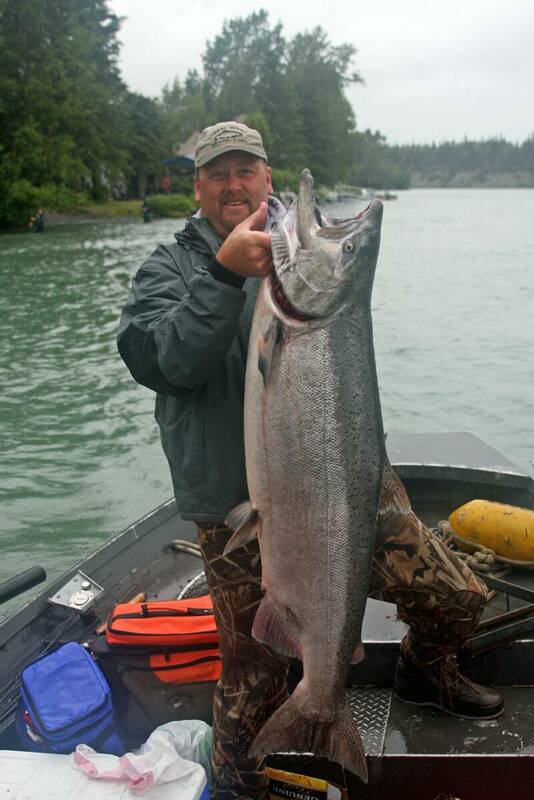 Kenai Peninsula Fishing has it all! Kenai River power boat Salmon Fishing, Kasilof River drift boat Fishing for Rainbow Trout and Salmon. Homer, Ninilchick and Seward for the best Halibut and Salmon Fishing in Alaska. We can arrange guided remote fly-out or float plane trips to Fish an endless variety of remote lakes, streams and rivers for all species found throughout Alaska. Located on the world famous Kenai Peninsula, we are your best choice for the finest in Alaska Fishing Adventures! You can spend all week testing some of the finest Fishing in Alaska. You can target a different species in new waters each day. From fully guided Kenai River Fishing trips and remote fly-out adventures, to fabulous deep-sea saltwater excursions, Kenai Peninsula Fishing offers Alaska Fishing trips perfect for every Fishing enthusiast. 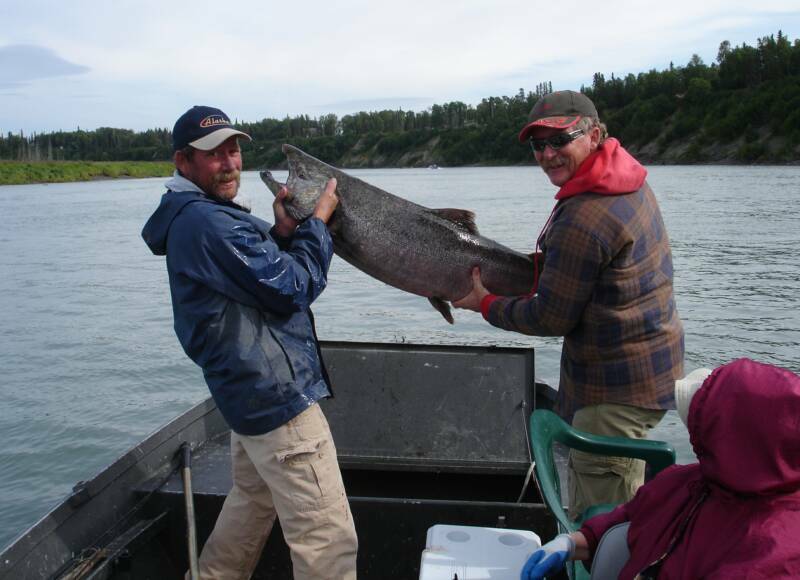 King Salmon come into the Kenai River in two overlapping runs. The first run of Kings begins mid May, and continues through the end of June. An average first run King weighs in at 35-45 lbs & can weigh upwards of 90 pounds. The first run fishing is less crowded and can be very productive. 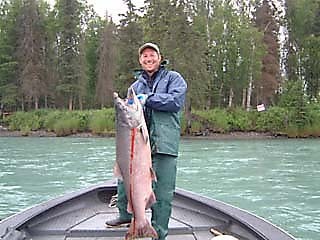 The Kenai River is world famous for producing trophy King salmon. Starting in May we fish this beautiful river in our 20’ Willie Predator Boats powered with Honda four stroke outboards. The preferred method of fishing is back trolling K-16 Kwikfish with a sardine wrap, back bouncing, and drifting salmon egg clusters. We arm each client with a 9 foot G-Loomis Rod with a Shimano reel filled with state of the art spectra Tuff-Line. 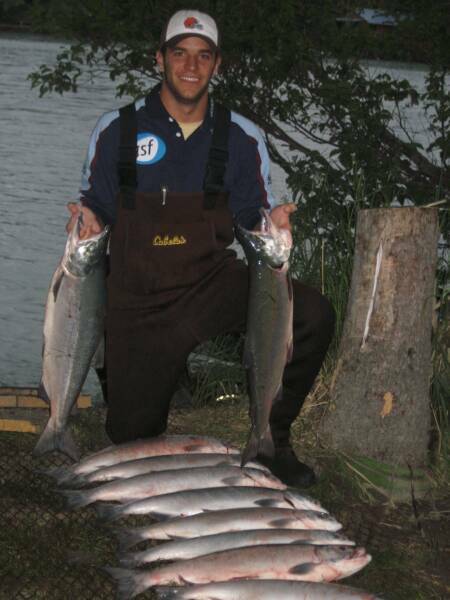 With two distinct runs of King Salmon, fishing is excellent all through May, June and the second run in July. Expect Kings on average of 30-50 pounds with many coming in at the 60, 70 and 80 pound class. The Kasilof River is a drift boat fishery. Being a shallow river we use 20’ Willie Drift boats, fishing 4 anglers. Our experienced guides will teach you the preferred method of back-bouncing salmon egg clusters. Using lighter rods usually 8 ½ foot G-Loomis you will experience the true thrill of fishing from feeling the bite, setting the hook, and battling the fish. The run starts in May and runs through June and the last half of July. Average size being a respectable 15-30 pounds. Awesome fishing and unstoppable action! 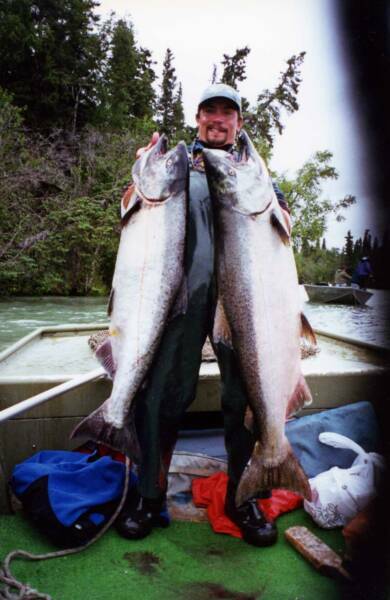 Saltwater King Salmon combo trips are a favorite May fishery for many anglers. Fish King Salmon entering the Cook Inlet in search of their home river. With thousands of fish returning the Inlet fishing is awesome. Trolling herring in depths of 15-40 ft these Kings will take you for a ride in the wide-open ocean. But don’t leave to early, after fishing the tide for King Salmon we take our 28’ Offshore Cruisers out in the depths for Trophy Halibut. Fish for Salmon and Halibut all on one trip! 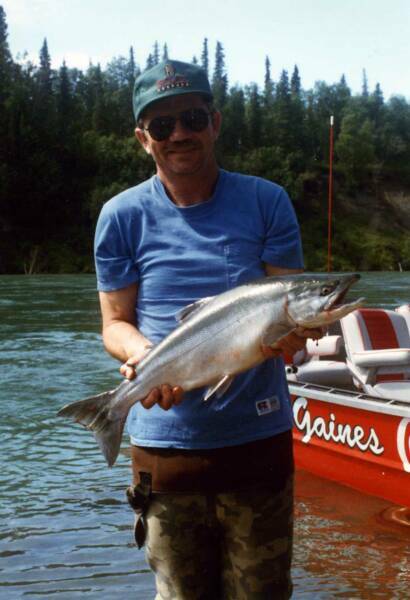 Kenai River Silvers are a local favorite because of the relaxing Fishing techniques and plentiful bounty. Our method of Fishing on the Kenai and Kasilof Rivers consist of anchoring the boat and back bouncing salmon egg clusters or Kwikfish, or casting spinners, The take down of the rod is by far the most exhilarating part of the battle but don’t set the hook to early, they are know to leave many anglers bait less and scratching their heads in disbelief. Pink Salmon run on even years. Returning in even numbered years in late July through August, Pinks are the single most aggressive Salmon that return to the Kenai. Their sheer numbers and willingness to strike anything shiny makes them a favorite with kids, novice Fishermen, and anyone who Fishes for the thrill of the catch. Best when taken fresh from the salt water, Pinks have a delicate white flesh that looses its texture rapidly once they enter fresh water. Caught by casting spinners and spoons. Seward (Resurrection Bay) Silvers Ask us about the Seward Silver Salmon Derby. This salt water Fishery is in mid-August and has a 6 fish limit. Mooching cut-plug herring as bait, our captains will put you in to amazing huge schools of Silvers. With a few cranks up and a fluttering rod tip it's FISH ON! This Fishery begins in August and is becoming a must do by all of our clients. But the action does not stop. Ling Cod, Sea Bass, Red Snapper and Halibut are also on the menu. Sockeye Salmon or otherwise know as Red Salmon average 6-12 lbs & are know for their awesome fights and excellent table fare. Some believe that Kenai River Sockeye Salmon are the best eating Salmon in the world and pound for pound the best fighters. 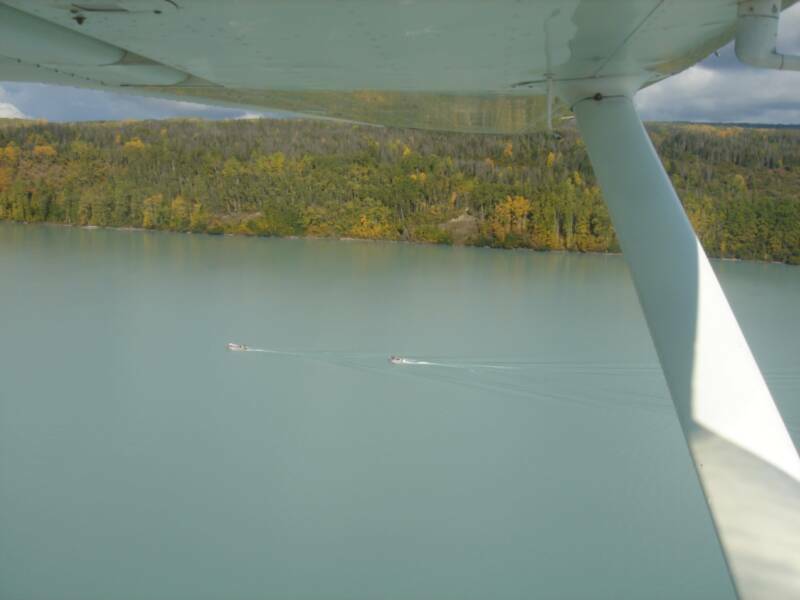 Each year literally a million Sockeye Salmon enter the Kenai River. This makes for some awesome Fishing action. Sockeye tend to hug the bank so most Fishing is done from the shore. Our guides can lead you to a stretch of river where you will get out of the boats and Fish off the banks. At times it will be in the lower river and at other times the guides will lead their clients into the beautiful Kenai National Wildlife Refuge where competition is less. With a quick roll cast up river, a style found only on the Kenai, a 3/0 salmon hook seasoned with colored yarn the fireworks begin with an explosion of FISH being hooked and lost. Don’t worry Fishing is fast and frantic and the three Fish limit is an easy task to complete. Hooking a hundred Fish in a day is not uncommon from an avid angler. Fly-Out Fishing for Sockeye Salmon. Enjoy a scenic trip across Cook Inlet aboard a floatplane and Fish untouched rivers for Sockeye Salmon. You will have a few friends around (Brown Bears) but do not worry the BEARS are after the same thing you are, the FISH. Barn door-sized Halibut Huge Massive and Giants are some of the words we hear when clients talk about the great Halibut Fishing in Cook Inlet. Even our most seasoned clients have a difficult time against these delicious giants. 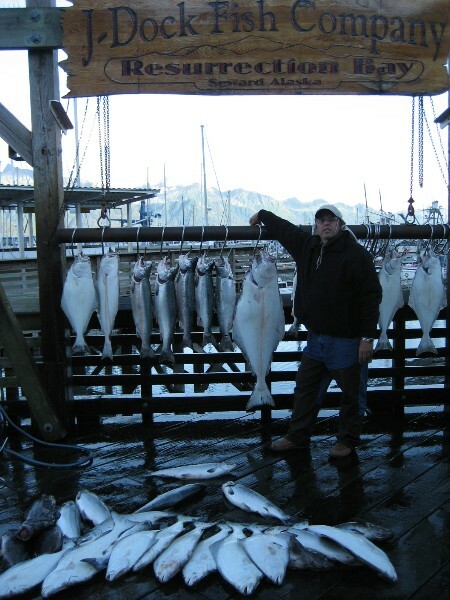 Our Halibut average 25-50 pounds with hundreds caught over 100 pounds each year. Some customers have caught them in the 200 and 300 pound class. Fishing is steady throughout the whole season. Imagine yourself catching Fish this big! You will definitely be the envy of all your Fishing buddies when you pull out that picture of your Halibut that weighed in over the century mark. Our Captains are the best in the area and operate the finest of saltwater boats. Cook Inlet is the most productive Halibut Fishery in the World. Fish Deep Creek or Seward in our 28' Offshore Cruisers. Our experienced captains and crews will get you to the Halibut grounds fast and safely. Custom built for Cook Inlet Halibut Fishing, our vessels come equipped with enclosed heated cabins, huge Fishing decks and marine bathrooms, but don’t get to comfortable, these Halibut are tough customers and we are ready for anything they give out. Boats are loaded with G-Loomis Saltwater Series Rods, and our Penn Reels filled with 100-pound Spectra Tuff-Line. Heavy equipment for those strong fought battles with BIG FISH. It is great Fishing action from May till September. Nothing can be said about this rich Fishery except AWESOME! Homer the Halibut Capital of the World has the largest fleet of Halibut charter boats of any harbor in Alaska. This Fishery also Fishes the same waters of Cook Inlet and is 20 miles South of the Deep Creek beach launch. 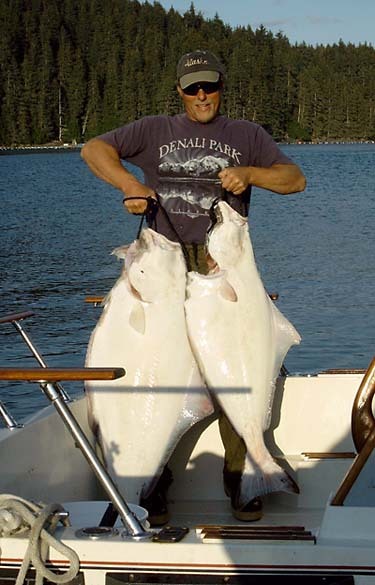 I have Fished Cook Inlet for over 25 years now and if you asked me which one was better and where you should Halibut Fish, I would have to say you better try BOTH. 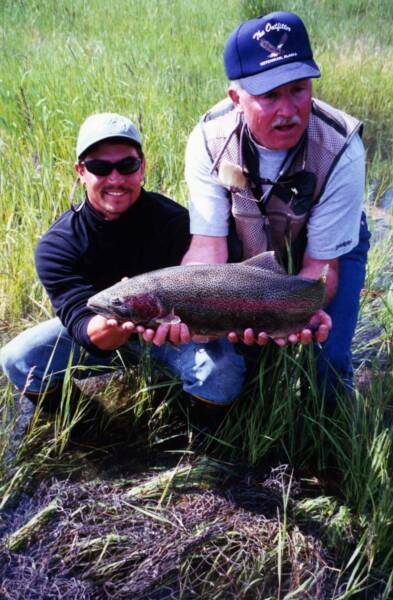 Kenai Wildlife Refuge The kind of Rainbow Fishing you have always dreamed of is waiting for you on the Kenai River. With a short drive to Sterling we launch the boat and head up river to the untouched Kenai Wildlife Refuge. The scenery and wildlife is even more prominent through this section of the Kenai River. It is very common to view Moose, Bear, and a very wide variety of birds and of course awesome Rainbow Trout Fishing. A trip to the Kenai River is not complete without a Trout Fishing trip You can expect to catch two and three pound Rainbow Trout on the average, with eight to ten pounders very common. As all Trout lovers know these are all very respectful Fish but we are always looking for those fifteen to twenty pound class Fish. They don’t come along daily but…. You never know how lucky you are! Kenai Canyon Monster Bows The catch will be Predominately Native Rainbows, but we also catch Dolly Varden, Lake Trout and White Fish. You will soon find all the species in battle fight in their own unique way. The Rainbows with all its power and grace, the Dolly barrels rolling up the line. With extensive Fishing and years of knowledge we will lead you to some of the finest Rainbow Trout Fishing you will ever experience. Trout Fishing is fantastic when it opens in the rivers on June 11th. The best Fishing for Monster Bows is August and September. Seward (Resurrection Bay) Silver Salmon. Everyone loves a double header, two Fish on at once, but aboard our Offshore Cruisers in Seward, Alaska imagine all six anglers aboard with a Fish on. This is a regular occurrence in Seward. Mooching cut-plug herring as bait our captains put you in amazingly huge schools of Silvers. With a few cranks up and a fluttering rod tip it's FISH ON! These Fish are 10-20 pounds and with a 6 Fish limit, action lasts all day! Ling Cod, Sea Bass & Red Snapper & Halibut To our Bottom fish aficionados we offer extended trips out of Seward for monster Ling Cod. These Fish are by far the ugliest but best eating Fish in the Alaskan waters. Ling’s are caught up to 60 pounds with the average being about 30-40 pounds. You will be occupied with all types of bottom Fish while on your quest for that Trophy Ling Cod. These areas also produce some giant Yellow Eye (Red Snapper), Sea Bass numerous other kinds of Rockfish and Salmon. Using lead headed jigs and plastic grubs with Salmon rods makes for fantastic Fishing for anglers of all skill levels. Plan your trip today!!! Halibut Fishing in Seward also offers some great overnight Fishing trips to pristine waters not regularly Fished by other boats. Volcano Flight Seeing Many of our guests enjoy seeing the more remote parts of Alaska and experiencing nature at its purest. We use High Adventure Air for most of our flying needs. They have been operating for 30 years and are very well known for their safety, extensive knowledge and excellent pilots. Sockeye Salmon & Unbelievable Bear Viewing In June and July we can send you on a fly-out Fishing adventure to the pristine waters of Wolverine Creek. Looking down into the clear waters you will literally see thousands of Sockeye Salmon. Catching these Salmon are an easy chore but the Bear-Viewing is hard to top! You will have some fury-Fishing partners on the nearby rocks waiting for their chance at catching these Salmon. Pictures can’t tell what it feels like to Fish with the Brown Bears. Silver Salmon Nearing the end of July through August, the Silver Salmon choke the rivers and streams bordering Cook Inlet. 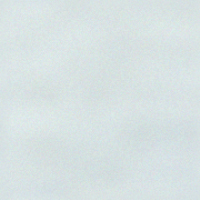 Big River Lakes and the Kustatan River hold World-class Silvers with limits taken easily. These trips also offer some wonderful wildlife viewing. The destinations are endless! You let us know what you want to go after and we will make sure you get there. Salmon, Char, Rainbows, Northern Pike, Grayling or just Sightseeing you will enjoy an experience of a lifetime. Our flyout Silver and Red salmon trips take you by Dehaviland Beaver or Otter to Big River Lakes and the Kustatan River across Cook Inlet. 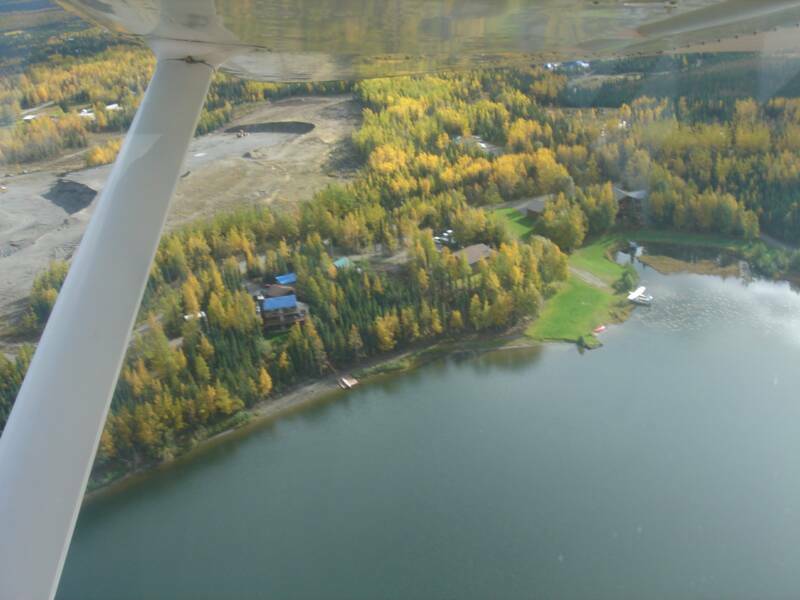 Along with a classic Alaskan Fishing experience in the bush, you will enjoy the 20 minute scenic flight with opportunities to see bears, moose and other Alaskan wildlife. The season's first "Fishable volume" of "Reds" begins around June 10 and those scrappy and hard fighting Silvers begin to run about July 21. The Fishing itself is most always fast action and catching a day's limit is the norm. During and after Fishing, bear viewing is frequently the best way to end the day. With the use of boats, it's common to get within 50 feet of wild Alaskan grizzlies and black bears.